Background: The use of botulinum toxin in aesthetic reshaping of the mandibular angle has been well established in East Asian populations. This has not previously been investigated in Western populations. Objective: Our objective was to determine the efficacy of botulinum toxin injections in aesthetic reshaping of the lower face in Western populations and compare it to that in East Asian populations. Methods: Thirty-four Western patients (study group) had their masseteric muscles injected with botulinum toxin with an initial dose of 25 to 30 units on each side. This was compared to 48 East Asian patients (control group) who received an initial dose of 40 units on each side. Results: All patients achieved aesthetic improvement of the shape of their lower face, with an additional improvement in functional outcome attributed to bruxism in Western patients. There were few complications. The therapeutic dose for the Western population was lower than that for East Asian patients. In the Western population, aesthetic improvement lasted from 9 to 12 months, while the functional improvement from bruxism lasted for 6 to 7 months. Conclusions: Botulinum toxin is effective in improving the aesthetic appearance of the lower face and the functional outcome in Western patients with masseteric hypertrophy. The use of botulinum toxin type A (BTX-A) for aesthetic reduction of the masseteric mass and contouring of the lower face has been well demonstrated and is well established in East Asian populations. 1,2 While successful use of the toxin in reduction of the masseteric mass for functional problems (bruxism and temporomandibular–mandibular joint pain) has been demonstrated in Western populations,3 the purely cosmetic application of BTX-A in the masseteric region has not previously been established in patients of non-Asian origin. As is recognized in East Asian populations, most women desire a slimmer lower face and consider an ovalshaped face to be the most aesthetically pleasing face shape. While this shape is typically regarded as being “Western,” it is of course not uniform in Western populations, and many patients of non-Asian origin share the round or square-angled shape considered unappealing and unfeminine by individuals of East Asian background (Figure 1).1 A growing number of non-Asian patients similarly find this slimmer lower face more aesthetically pleasing and seek to attain such a face shape. The aim of this study was to determine the efficacy of BTX-A in lower facial contouring in Western populations and compare this with the efficacy of the same technique in our East Asian population. All treatments were carried out according to the principles set forth in the Declaration of Helsinki. Written informed consent was obtained from all patients, and before commencement of treatment, all patients were informed that further injections might be required after the first treatment. All patients in the study had obvious hypertrophy of the masseter muscle, with a noticeable bulge at the angle of the mandible. All patients were followed- up at week 4 and 8, followed by 3 to 6 visits on a monthly basis. 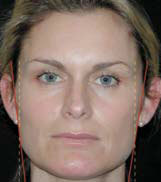 The end point of treatment was measured by patient satisfaction and/or no palpable contraction of the masseter muscle. 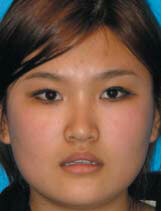 Initially there was a general assessment of the patient’s facial shape and aesthetics. The width of the lower face was analyzed, the masseter muscle was palpated and the degree of bulkiness assessed during contraction, and the degree of soft tissue thickness and any degree of bony flaring of the angle of the mandible was noted. A standardized series of pretreatment photographs were taken. To objectively quantify the changes in lower face shape following treatment, the following lines and angles were drawn and measured from the patient’s frontal facial images. 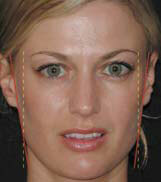 A vertical line was drawn delineating the midline of the face (Figure 2). An oblique line was drawn from the most lateral aspect of cheek to the angle of the mandible (outlining the vertical portion of the jaw). Both lines intersected at the apex of the angle of the mandible. The angle of inclination of the vertical component of the jaw with the midline was measured. Figure 1. B, A young white woman with a square angled lower face similar to the East Asian woman in part A. Figure 2. Measuring the angle of the lower face. The midline (yellow dotted line) of the face is plotted and transposed to bisect the vertical portion of the jaw (red line) at the apex of the angle of the mandible. 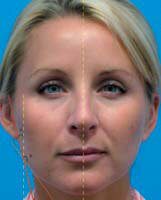 Angle A is the angle between the vertical portion of the jaw and midline of the face. Figure 3. Standard injection pattern. 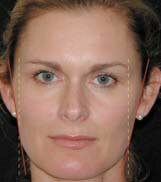 Vertical lines outline the anterior and posterior borders of a masseter muscle. Injection points are limited to the lower half of the muscle and below a line joining the external auditory meatus to the middle of the philtral column (to avoid injection into the sigmoid notch of the mandible). Our study group consisted of 34 female patients; 28 were of Anglo-Saxon origin and 6 of Mediterranean origin. All patients felt that they had excessive bulge at the corner of their jaw and thought that their lower face was too wide. All desired a slimmer lower face. All patients received BTX-A (Botulinum toxin; Allergan Inc, Irvine, CA) injections for the primary purpose of reducing the bulk of the soft tissue mass at the angle of the mandible. The patients’ ages ranged from 21 to 52 years. All patients in this group also suffered from bruxism of varying degrees. Twenty patients had braces that were prescribed by their dentists for bruxism (before presentation for this treatment). Our control group was comprised of 48 East Asian female patients from the senior author’s (SL) database who were available to be used as the control group for this study. The patients’ ages ranged from 19 to 35 years. All patients received BTX-A injections for the primary aim of cosmetic reduction of the fullness at the angle of the mandible, thereby reducing the width of the lower face. None of the patients had a history of bruxism. All patients followed the same injection technique as described below; however, the initial dose of BTX-A varied. One hundred units of lyophilized BTX-A was reconstituted with 2 mL of sterile normal saline, giving a concentration of 5 units per 0.1 mL. The solution was injected with a 30-gauge hypodermic needle attached to a 1-mL syringe. The area of injection was marked by outlining the anterior and posterior borders of the masseter muscles by instructing the patient to clench the jaw. Five injection points were placed at the lower half of the muscles (main bulk). The injection points were at least 1 cm from the borders of the muscles and below a line drawn from the lower part of the external auditory meatus to the mid-philtrum of the upper lip (Figure 3). The injections were deep and intramuscular. 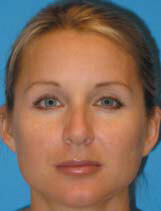 For the Western treatment group, each patient received an initial dose of 25 to 30 units in each masseter muscle. For the East Asian group, based on previous experience of the senior author on East Asian patients, the initial dose was 40 to 45 units on each side. Patients who showed a minimum response on week 8 were offered additional injection of 10 to 20 units on each side. All patients in the group were followed-up for a period of 10 to 18 months. 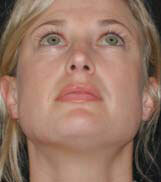 All patients showed clinical improvement of the facial shape following injection of their masseter muscles. The angles of the lower face also improved aesthetically to that of a more pleasing, softer appearance, approaching the ideal oval-shaped face (Figures 4 to 6). In addition, all patients experienced significant relief from their bruxism, and claimed that the injection relieved the tension in their muscles and the headaches that arose from the bruxism. The onset of action was noticeable from 2 to 4 weeks following the first injection, and most patients relayed that they were now receiving comments that they “looked slimmer.” BTX-A reached its maximum effect at 2 to 3 months postinjection. The duration of the cosmetically desirable effect lasted from 9 to 12 months. The duration of functional improvement (from clenching and grinding teeth) lasted between 6 and 7 months. 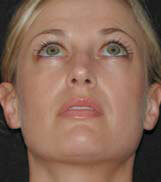 Of the 34 patients, 1 required a top-up injection 8 weeks postoperatively because of asymmetry of the lower face. Ten units of BTX-A were injected on the affected side to reduce the residual muscle bulge. One patient required reinjection because of the recurrence of troublesome bruxism 6 months postoperatively. All patients were very satisfied with the slimming and facial contouring effect of the BTX-A. All patients in the control group were similarly followed over a period of 10 to 24 months. All had an initial starting dose of 40 units on each side of the masseter muscle. 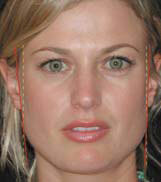 All patients showed clinical improvement, with slimming of the lower face (Figure 7). Thirteen patients required a top-up of 10 to 20 units on each side 8 weeks postoperatively because of suboptimal results. Four patients required a top-up 6 months after the initial injection. One of these patients was among the 13 that required a further injection at 8 weeks. Study group. Two patients complained of a significant muscle bulge at the angle of the mandible within 24 hours postinjection. One sustained bilateral swelling, the other only on one side. The bulge was not associated with any induration, tenderness, or bruising of the muscle or its overlying skin. The bulges were noticeable only on clenching of the mandible. Both cases were treated conservatively with complete resolution within 10 days. There were no reports of weakness on chewing. Two patients complained of changes of facial expression. Both claimed a reduction in the width of the mouth upon smiling. The effect lasted for 2 months. One patient claimed to notice worsening of the jowls in the first 2 months following the initial injection. This resolved after that period. Control group. Three patients reported a transient weakness in chewing that lasted for 2 to 3 weeks following the injection. There were no incidences of changes in facial expression. Figure 4. A and C, Pretreatment views of a 38-year-old woman with bruxism outlining the bulge of hypertrophic masseter muscle at the angle of the mandible. C, Pretreatment measurement of the shape of the lower face (5°; right jaw). B and D, Posttreatment views 3 months following 25 units of botulinum toxin type A on each side, resulting in a more harmonized and rested facial appearance. 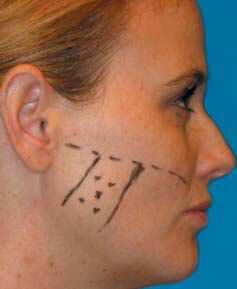 D, Posttreatment measurement showing the improvement of the angle of the lower face to 10° (right jaw). Traditionally, patients who presented with benign hypertrophy of the masseteric muscle were treated with surgical debulking of the muscle, often combined with shaving ostectomy of the underlying mandibular angle if there was bony involvement. The use of BTX-A for the treatment of such pathology was first reported in 1994.4 Since then, there have been a number of reports on the efficacy of BTX-A injections for bruxism and temporomandibular– mandibular joint dysfunction.5,6 In recent years, the use of BTX-A injection as a purely cosmetic therapy for masseteric hypertrophy in East Asian populations has been firmly established. Such application in the Western population has not been reported. This study demonstrated that BTX-A injection into the masseter muscle is an effective nonsurgical tool in both Western and East Asian populations in order to reshape the lower face into one that is more aesthetically pleasing. The technique and procedure are associated with high levels of patient satisfaction and safety, and carry minimal morbidities. The two cases where patients complained of reduction in the width of the mouth aperture on smiling were probably related to the diffusion of BTX-A to the neighboring buccinator or risorius muscles. 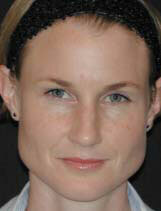 Therefore, it is important to keep the injection point at least 1 cm from the anterior border of the masseter muscle. The injection points should also be kept below the sigmoid notch of the mandible in order to prevent inadvertent paralysis of other muscle of mastication, namely the pterygoid muscles (an imaginary line from the auditory meatus to mid-philtrum). The few cases of weakness of chewing lasted for less than 4 weeks and coincided with the onset of paralysis of masseter muscle. This is important information to convey to patients during consultation, because it is an expected phenomenon rather than complication. The swelling of the injected regions in 2 cases was probably caused by minor bleeding within the muscle. This resolved spontaneously. 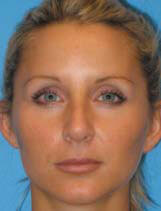 One patient felt worsening of the appearance of her jowls within 2 months of injection. This was a 50-year-old woman with mild jowl formation noted before treatment. The rapid and effective reduction of the muscle bulk would have certainly caused the deterioration. In time, the overlying skin and soft tissue re-accommodated and contracted to the new position with improvement of the jowl position. Figure 5. A, C, and E, Pretreatment views of a 32-year-old woman with a “square face.” C, Pretreatment measurement of the lower face (1°; left jaw). E, Submental view. B, D, and F, Posttreatment views 5 months after injection of 30 units of botulinum toxin on each side, showing significant reduction in the width of the lower face and accentuation of the cheek prominence with contouring effect of the submalar region, creating 'the blush effect.' D, Posttreatment measurement showing the improvement of the lower face angle of 9°. F, Submental view shows reduction of the bulk of masseter muscle. The incidence of masseteric hypertrophy in the East Asian population, or “square face,” a term used commonly among East Asian populations, ranged from 7% to 16% based on a self-reported telephone survey conducted in 2004 by the research firm ACNeilsen on behalf of Allergan Inc. Currently, the authors are not aware of any such data in the non-Asian population. It is our observation that masseteric hypertrophy is not uncommon in non-Asian patients, but Western culture has, to date, placed less emphasis upon and perhaps has not recognized facial shape as a determinant of beauty. While the modern facial aesthetic depicts a strong and well defined jawline as attractive, the presence of excessive prominence of the angle of the mandible or excessive flaring is certainly considered unappealing and unfeminine by white and East Asian females alike. Figure 6. 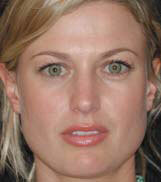 A, Pretreatment view of a 31-year-old woman with a wide lower face. B, Posttreatment view 5 months following injection of 25 units of botulinum toxin on each side, demonstrating a reduction in the width of the lower face and accentuation of the cheek prominence. Figure 7. 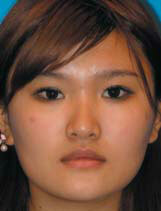 A, Pretreatment view of a 23-year-old woman with a square face. B, Posttreatment view 6 months following injection of 40 units of botulinum toxin on each side. This study has shown that almost all patients in the non–East Asian group have a reactionary cause of the masseteric hypertrophy from bruxism compared to the East Asian population, where it is caused by benign masseteric hypertrophy. As a result, in addition to the aesthetic benefits, all patients in this group also had added functional relief from their teeth clenching or grinding habits. This enabled most of the patients who were prescribed mouth guards and other dental equipment to abstain from using them. In the Western population, the slimming of the lower face further accentuates the cheek prominence and creates a shadow in the submalar zone. We call this recontouring effect the “blush appearance,” which most women attempt to create with makeup in their daily routines. This study has demonstrated the efficacy and safety of BTX-A in the management of masseteric hypertrophy in both the Western and East Asian patients. In the Western population, in addition to the aesthetic benefits of reshaping the lower face, it also accentuates cheek prominence, by creating the highly desirable “blush” appearance while simultaneously providing functional relief from the common symptom of bruxism in this study group. This technique not only allows clinicians to nonsurgically enhance the lower facial shape in suitable patients, it can also be combined in surgical face lift patients with residual muscular bulge in the angular region following surgery, to further enhance the patient’s jawline. The authors have no financial interest in and received no compensation from manufacturers of products mentioned in this article.